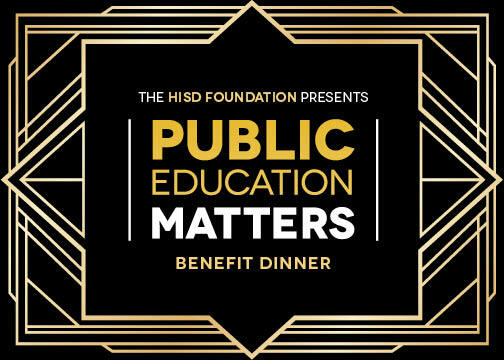 The Houston Independent School District Foundation, a nonprofit organization that raises funds to support HISD’s strategic initiatives, will hold its Public Education Matters Benefit Dinner on Tuesday, March 5. The event will highlight the importance of community investment in public education and focus on the social and economic impact that results when public school students receive a quality education. The evening program includes a one-on-one conversation with HISD Interim Superintendent Grenita Lathan and John Quiñones, host of ABC’s “What Would You Do?” That conversation will be followed by a “Fireside Chat” moderated by Quiñones with distinguished panelists, featuring Lathan, Teach for America CEO Elisa Villanueva Beard, and education advocate and founder of Harlem Children’s Zone Geoffrey Canada. The evening event, which is being held in lieu of HISD’s annual State of the Schools luncheon, will take place from 6:30 to 9:00 p.m. at the Hilton Americas Hotel (1600 Lamar St., 77010). Funds raised at the benefit dinner will go directly to the HISD Foundation to support strategic student-centered initiatives like the Innovation Fund, which financially supports community gardens, robotics, coding, and literacy programs. Principals are invited, along with their school’s Teacher of the Year, to attend. Principals can click here to reserve their seats by 5 p.m. on Tuesday, Feb. 19. This entry was posted in News, Volunteers and partnerships and tagged HISD Foundation, Public Education Matters Benefit Dinner on February 6, 2019 by HISD Communications.